FOOD MATCH: The back label suggests pairing it with aged cheeses, lamb, or roasted red meats. It went well, too, with pasta dressed with a fresh, spicy tomato sauce and crumbled Impossible Burger. WHEN TO DRINK: It’s not meant for aging, but there’s no rush to drink it. Enjoy it at your leisure. My local price is consistent with Wine-Searcher.com’s $10 average retail. Typical of Montepulciano d’Abruzzo, it’s a fine value. Only a few U.S. vendors currently offer Gran Conti 2016 Montepulciano d’Abruzzo on Wine-Searcher.com, but keep checking. 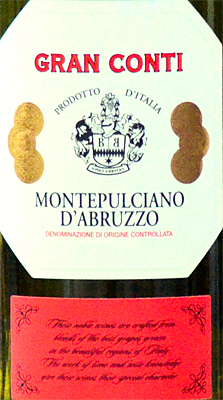 You can also browse Wine-Searcher.com for dozens of other good wines of Montepulciano d’Abruzzo.